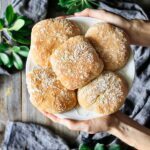 These chewy homemade ciabatta rolls will make any sandwich taste amazing! Ciabatta is a rustic Italian bread that’s crisp outside and soft inside, making it super tempting and ultra delicious. Dump the bread flour into the bowl of a stand mixer. Add the salt and yeast on opposite sides of the bowl, then stir in each one with your finger. The salt can kill or slow down the yeast’s growth if it touches the yeast directly. Pour the olive oil and half of the water onto the flour and begin mixing with the paddle attachment on low speed. Trickle in the remaining water until the dough is extremely sticky and is about the consistency of a very thick batter. You might not need all the water. Knead the dough on medium speed with the paddle attachment for about 5-8 minutes, until the dough is very well mixed and can stretch at least 3-4 inches without breaking. Lightly grease a 10-cup square or rectangular plastic container with olive oil, then pour the dough into the container. Cover with greased plastic wrap and allow to prove at room temperature until at least doubled in size, about 2 hours. Preheat the oven to 415 F. Line two 11 by 17-inch cookie sheets with parchment paper. Generously dust a large wooden cutting board with a thick layer of bread flour and semolina. Carefully turn the plastic container upside down and gently pour the ciabatta dough onto the floured board. Cut the ciabatta dough in half lengthwise with a sharp knife, then cut each long piece into five smaller pieces to get ten buns. Handle the dough very gently to keep as much air in the dough as possible. Flour the knife and your hands as needed, since the dough will be extremely sticky. Roughly shape each piece of dough into a square, then gently transfer the buns to the prepared trays. Don’t worry if they look flat; they’ll puff up as they prove and bake. Leave the buns to prove for about 20 minutes, until they have noticeably increased in size. Bake the ciabatta buns one tray at a time for about 20-25 minutes each. The buns should be crisp, nicely browned, and have an internal temperature of at least 200 F.
Let the buns cool completely on a wire rack, then serve. Store leftover buns in a zip-top bag at room temperature, or freeze for later. The key to a good ciabatta is a slow prove. If the dough is rising too quickly, put it in a cool place or even in the refrigerator. A long prove gives the dough a much better flavor, and for ciabatta, an irregular, open crumb structure means it will have larger air holes. Make sure to immediately start shaping the ciabatta buns if your risen dough starts to fall. If you don’t have semolina flour in your cupboard, corn grits will work just as well for dusting the work surfaces.